The ethos of sustainable design is all about, deeply understanding the entire process from sourcing, to energy and water consumption during the production process, to where the product will ultimately end up. Cradle to Grave. 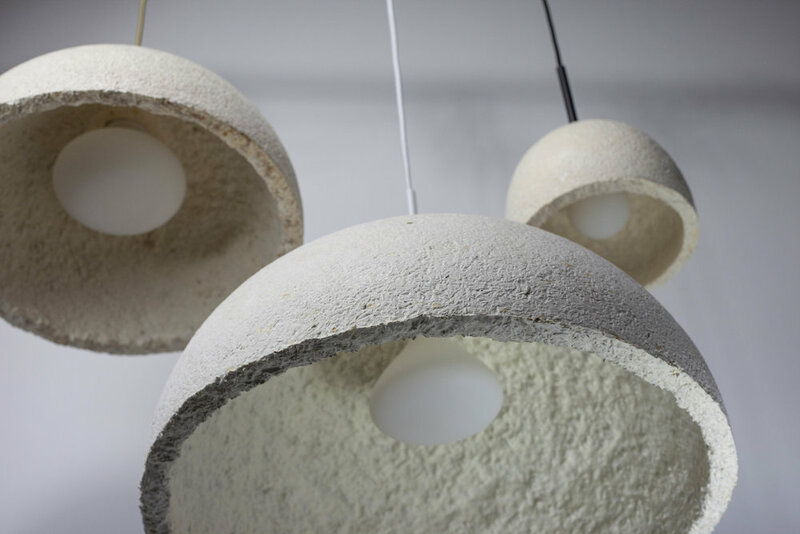 The MushLume Lighting Collection utilizes a sustainable crop (hemp) and combines it with a rapidly renewable living organism (mycelium) and harness only the power of nature to GROW the lampshades that in turn can return safely to the earth (home compostable), adding nutrients back to the soil rather than pollutants. MushLume Hemi Pendant is all about pushing interior lighting to the limits with 24” and 18″ diameter dome structures made from organic, sustainable and biodegradable mushroom material. It’s a sizable representation of the adaptability of this dynamic material and an introduction into exploring new lighting materials. The MushLume Cup Light series is designed for a flexible lifestyle with its simple, yet elegant aesthetic and adaptability for use as a hanging pendant, table or floor lamp. The Cup Light Table Lamp features a steel base, custom brass hardware and American hard wood accents. Designed for tool-free assembly and ease of disassembly for reuse and recycling. The GROW Lamp series is our most accessible and sustainably produced lamp, with a base that’s made from felled or dying trees within a 100 mile radius in Upstate NY. Shaped after the curves of a trumpet, this hanging lamp is coupled with a hand-turned wood element and brass hardware. Biophilia -a love of life and the living world; the affinity of human beings for other life forms. Indoor vertical gardens are not only visually stunning and stimulate our innate, biophilic response, they also deliver physical and psychological benefits by regulating air quality, temperate and humidity, while also boosting mood and creativity. Go ahead and take your daily does of green, at home and in the office. Located in the LEED certified visitor center at the Brooklyn Botanic Garden, 3 fourteen-foot vertical gardens spiral down from ceiling to floor, eloquently inspiring visitors of the artistic and physical benefits of incorporating indoor gardens within our human spaces. A vertical, self-sustaining planter system that harnesses hydroponic technology making indoor gardening for the space constrained urban dweller an easier and exciting possibility. This self-watering system simplifies the process of growing your own plants so that interior gardening becomes much more accessible for those seeking a greener lifestyle. These hanging window gardens feature three different organic-shaped, 3D printed planter pods that rotate and can be placed in any configuration and height along a polished brass rod. The standard 36″ height fits most windows and can be connected to additional segments to span larger windows and offer greater modularity. 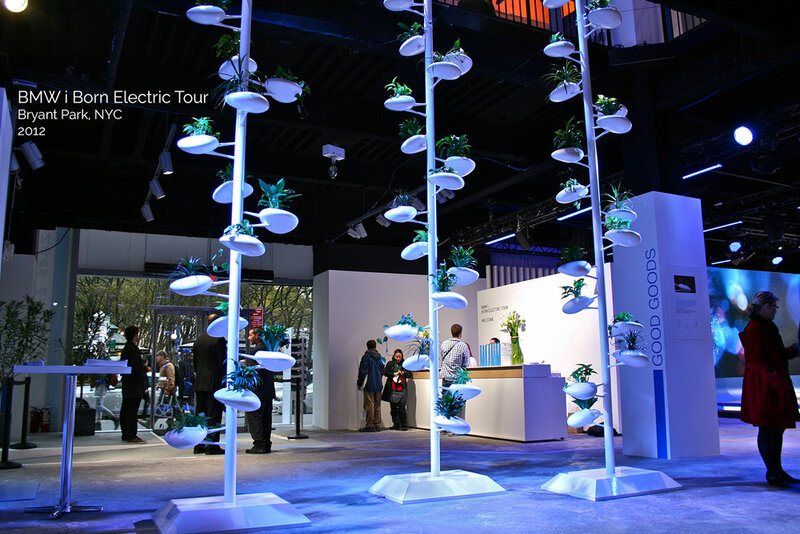 Danielle Trofe Design partnered with BMW i to create a sculptural vertical garden installation that climbed 20 ft. high and spanned two floors for the Born Electric World Tour 2012/13. Joining other local artists and designers as a Good Goods partner of the tour which was held in Bryant Park, NYC. The installation is designed to promote urban gardening and the integration of living plants into interior spaces by using vertical hydroponic technology. Exploring new frontiers and merging disciplines with one goal in mind: to create resilient solutions to our most pressing global challenges that result in outcomes that improve the condition and quality of ALL of life on the planet, not just humans. And to form more interconnected relationships and respect within and outside our own species. We like to ask “what if” and then take on the risk and responsibility of exploring that sustainability dream. Converting kinetic energy into visible light is no easy feat. We’ve spent years in R&D learning about and testing strategies for off-the-grid lighting solutions. Join our mailing list to be the first to know when this product is ready to launch! . The future of truly sustainable energy production lies across emerging technologies like solar, wind and biofuels. Our exploration examines the ability to collect, store and utilize hyper-localized energy produced through symbiotic relationships with living organisms. Carbon dioxide, a contributor to global warming, but also an abundant and free natural resource that just needs a different location than our atmosphere. Nature builds with carbon, so why can’t we, humans? By mimicking nature’s time-tested strategies we are exploring methods for capturing, converting and storing CO2.